The Lambda 10-3 is a high performance, microprocessor-controlled multi-filter wheel system for imaging applications requiring up to 3 filter wheels. 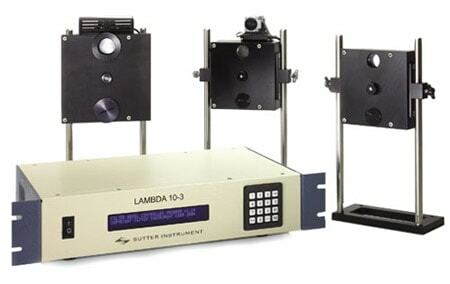 The latest generation of Sutter’s optical filter changer product line, the Lambda 10-3 uses recent advances in motor technology to achieve switching times of 40msec between adjacent filters. It features both USB and serial port interfaces as well as keypad control. The Lambda 10-3 is the upgrade to the Lambda 10-2 and ideal for imaging applications requiring multiple filter wheels. This new release offers faster switching times, control for 3 filter wheels/ 2 shutters, more communication interface options and a universal power supply. The Lambda 10-3 controls up to 3 filter wheels. The user can select between one of seven speeds, allowing the speed to be adjusted in accordance with the load of the wheel. The Lambda 10-3 can operate up to 40msec switching time speed at speed 1 with the traditional 25mm filter wheel as well as our newer, high-speed 32mm version. If additional speed of movement is desired we manufacture a special three position wheel which achieves switching times of less than 33 msec at speed 0.. Except for the 4-position compact wheel, our filter wheels employ a direct drive system consequently there is no belt slippage or backlash. In addition the Lambda 10-3 controller supports both the traditional Uniblitz shutter as well as our new SmartShutter® line. Our SmartShutter® is designed to mount on our filter wheels much like the current shutter is mounted so there should be no mounting constraints. In addition we support control of a standalone SmartShutter® from the controller, making it possible to control an external SmartShutter® wherever an additional shutter is required. The SmartShutter® sets a new standard for shutter performance and reliability. In the traditional shutter design there are two or more “leaves” that rub against each other. Given time, the blades will wear down, bind, and the shutter will fail to open. The SmartShutter® is designed with only one moving part, which virtually eliminates the effects of wear and markedly improves performance. Both our 25mm and 35mm SmartShutter® are capable of opening within 8ms from the time of the trigger and can reliably achieve repeat opening times of 20 cycles per second. The microprocessor-based controller provides exceptional versatility and is adaptable to various modes of operation and function. The SmartShutter® can be programmed for a variety of movement profiles or to produce a variable aperture by determining the degree of shutter opening. When used in our Lambda LS xenon light source and coupled with a liquid light guide, the shutter acts as a programmable neutral density filter. While the impulse of our shutter is minimal we have incorporated a “soft” action mode to decrease vibration if necessary. The command’s used to control of our new Lambda 10-3 is a superset of the Lambda 10-2 meaning all of the commands used to control the Lambda 10-2 . Additional commands are necessary to access the third wheel as well as the special smart shutter features. The SmartShutter® features can be programmed through the keypad so that you can use the old shutter commands to access the neutral density function or the soft shutter mode. Filter selection can be made directly from the keypad or from a computer via the serial or USB port. The controller determines the shortest route to the selected filter and an acceleration/deceleration algorithm minimizes vibrations during the movement of the wheel. Internal sensors ensure correct filter positioning and the current filter position is displayed on the front panel. The serial port accepts RS232 level signals through a DB-9 connector. USB input is made through a standard connector and can be directly connected to a PC USB port. The Lambda 10-3’s USB port interface supports multiple USB devices simultaneously, allowing a user to run in tandem as many units as USB ports. The line voltage for the Lambda 10-3 may be either 120 or 240 volts, 50 or 60Hz. The universal power supply will automatically switch to accommodate the line voltage – no user adjustment is required. As with the Lambda 10-2, an optional liquid light guide is available for applications requiring absolute vibration isolation, and/or spatial uniformity independent of wavelength.